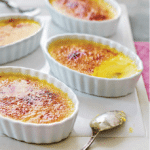 Crème brûlée, translated to “burnt cream,” is a silky cream custard finished with a thin crust of caramelized sugar. The custard base is a simple mix of cream, egg yolks, and sugar that’s poured into ramekins, placed into a water bath, and cooked until just set; it’s then cooled and given its signature finish by sprinkling the top with sugar and letting it go for a quick turn under the broiler to caramelize it. (Or if you have a culinary blowtorch, you can use it to caramelize the topping with a bit of added kitchen flair.) Here, Hell’s Kitchen has once again taken a classic and evolved it, expanding on the custard’s basic vanilla bean flavoring to include ginger, cinnamon, cardamom, cloves, and other chai spices for a warming, sweet, and spicy finish. PUT the cream into a saucepan with the vanilla bean, ginger, cinnamon stick, cardamom pods, and cloves, bring to a boil, and immediately turn off. Add the teabags and let steep for 15 minutes. As the chai steeps, prepare a pot of boiling water. Strain the custard and discard the teabags, ginger, and spices but reserve the vanilla bean. Split the bean lengthwise and add its seeds to the cream. Preheat the oven to 325°F. In a mixer on medium-high speed, beat the egg yolks and sugar until light and fluffy. Slowly mix in the warm cream mixture. Pour carefully into 10 x 4-ounce ramekins. Place in a baking pan and carefully pour the boiling water into the pan until it reaches halfway up the side of the ramekins. Bake in the water bath for around 20 minutes, until the outside of the custard is setting. Refrigerate for at least 4 hours, preferably overnight. Up to 2 hours before serving, preheat the broiler to its highest setting and sprinkle the custard with 2 teaspoons of sugar in an even layer. Put the crème brûlée under the heat as close as you can get it and watch carefully for the sugar to melt and caramelize. Pull out and cool completely so the top hardens before serving.